The exhibition was held in the Rare Books Exhibition space, Sir Louis Matheson Library, Monash University from 6 October 2009 - 28 February 2010 Opening address given by Professor Richard Larkins, Monash University. This exhibition displays highlights and discoveries from the Richard Travers Collection. 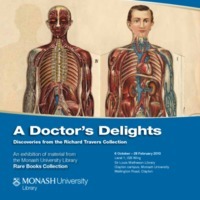 Richard Travers has donated an extensive collection of books in the historical and social aspects of medicine to the Monash University Library. The collection has a particular focus on Australiana and will be an invaluable resource for current and future researchers.